My love for maps outdates my love for Community Psychology. As a young child, I would look forward to road trips, down the shore or just to the store, because of the chance it afforded me to page through the large, multi-state atlas we kept in our car. Poring over maps, reading the symbols, computing distances between major cities/landmarks — this could keep me busy for hours. (Why my parents never allowed us to take the atlas into the house, I don’t know; it would have made a great babysitter). Now, over 20 years later, I am still fascinated with maps, and I've found multiple uses for them in my community based work. For example, for the past two years I've been working with the Wichita Health and Wellness Coalition — a group of individuals, from various sectors both public and private, who have come together with the goal of improving the health status of Wichita residents. The group takes a built-environment approach, and maps have been key to helping the group both identify issues/barriers to healthy eating/physical activity, and present the data back to the community in an accessible way. We've mapped almost everything: stores that sell fresh fruits and vegetables, transit routes, bike pathways, parks and centers for physical activity, routes kids walk to school, etc. Maps are really great tools to “sum up” what we know. Putting this information in visual form usually evokes some strong reactions or feedback. 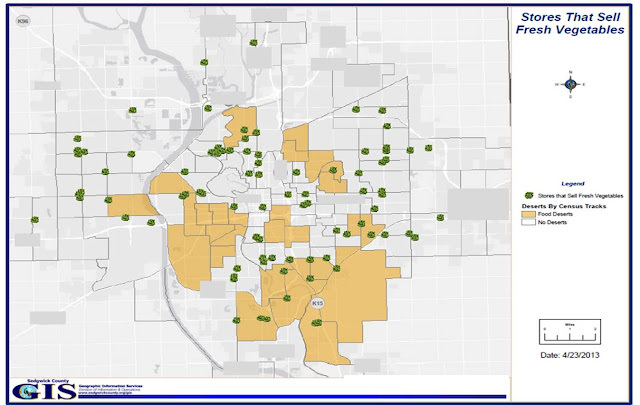 For example, we've had people ask questions related to issues of equity, because the map clearly shows that some parts of town have 3 full-service grocery stores on a single corner, and other neighborhoods have only convenience stores. These “aha” moments and insights into policy changes come more frequently when you layer data. For example, presenting data on food deserts, car ownership, and stores that sell fresh fruit and vegetables on one map clearly illustrates the problem that low-income families have in accessing fresh fruits and vegetables. Additionally, visually displaying the information also allows people to add in things we overlooked, such as neighborhood and church gardens. Lastly, maps are familiar — people may shy away from numbers and p values, but can relate to images of their neighborhood or streets they walk every day. Interested in using community mapping as a tool? Your map doesn't have to be complicated to be helpful. Start small, with a specific neighborhood or a radial area around your organization. And heads up - data collection for mapping tends to be physical. A lot of driving (or walking) around and noting exact locations. It’s a tedious process, but a crucial one. Not only does it give you the most accurate information, but it gives you a chance to engage community members, who will definitely say something when they see you scribbling notes on a clipboard about the condition of a bus stop, per say. In this way it’s both data collection and awareness building. Once you have the data, there are many free mapping programs that you can use, from simple to complex. If you’re just starting out, I would recommend using Google Maps, because it is probably a program you are already familiar with. Benefits to Google Maps include allowing more than one person to store/enter/edit maps, and direct address recognition. (To create a custom map on Google maps, go to “My Places,” then click, “Create Map.”) If you are looking to use national/state data, various organizations maintain their own mapping tools - such as USDA’s Economic Research Service or the US Census. There you can customize data you are interested in, for a specified geographical area; the limitation is, since they are public sites, they won’t let you upload your own, locally collected data. Finally, if you want to have a map that combines local data that you collect with these national data-sets it would be worth checking out an organization you may be working with - such as a university or even a community group (for example, the YMCA of the USA makes free web-based GIS software available to all of its affiliates), may have access to GIS software (web-based or otherwise). GIS is harder to work with (not always intuitive), but it allows you to layer data in interesting ways. My advice for those of you about to undertake a GIS project is to make sample maps with “fake” data first. This will give you some insight into how to collect your local data in a way that will make it easy to integrate into your mapping program. Next time I’m planning on writing about my favorite community-based maps. Communities have gotten really creative about how they choose to represent themselves and their assets. If anyone has done an interesting map lately, please let me know! (Spoiler Alert: One of my all time favorite maps is of pumpkins set on the steps at Halloween).